True artists develop their craft at a young age as was the case with Casey Pesce, Executive Chef and owner of D’jeet. When his boyhood friends were hanging out on the block playing ball, Casey could be found learning how to make homemade sausages alongside his grandfather in his butcher shop. If you have ever stepped foot in D’jeet you will immediately recognize this is a special restaurant, a refreshing reprieve from your typical fare found in suburbia. The changing menu reflects the availability of seasonal ingredients and Casey’s newest creations. The dishes are thoughtful, inspiring, and healthy using only the highest quality ingredients. This has been a cornerstone of Casey’s cooking philosophy ever since he was a young boy in the kitchen watching his grandparents on both sides of his family prepare meals. It was a given that he would be asked to go out to his father’s well tended garden and pick fresh tomatoes, basil, green beans, figs, and whatever else was growing at the time. So Casey has been cooking in this way long before it became fashionable for his dad instilled in the joy that comes with growing one’s food. Early memories of Casey’s childhood revolved around preparing meals alongside his mother, grandparents, aunts and uncles for he comes from a family of caterers, butchers, gardeners, but more importantly lovers of a good meal. It surprised no one when Casey decided to pursue cooking professionally for he had played an integral role in preparing family meals since he was old enough to chop garlic. Casey worked his way up the culinary ladder from dishwasher to owner and Chef of his own restaurant. Much of Casey’s present success rests in the fact that Casey learned the business from the inside and eventually opened his own restaurant. At 15 he started working as a dishwasher and breakfast cook at The Windjammer and two years later he had his first career break at the Grenville Hotel in Bay Head. There he worked as a roundsman for Chef Daniel P. Cummings, diamond award winner for best brunch for consecutive years. Later, Casey graduated with honors from the Academy of Culinary Arts. He also studied macrobiotic cooking in Tuscany with acclaimed Chefs Christina Pirello and Patrick Vere. There he also attended pasta seminars with Italian chef and author Giuliano Bugialli. Immediately following graduation he landed a job at the famous Rumson Fromagerie where he was quickly promoted to executive sous chef. There he learned classic French techniques, charcuterie, butchery, and refinement. He was then hired at Mumford’s Culinary Center as an Executive sous chef for Chef Chris Mumford. Casey’s diligence, persistence, humility and eagerness to learn from all those he worked alongside made him a perfect student. He easily won their respect and recognition as a man who would eventually do his own thing in the business. Because these qualities were so transparent, many offered their invaluable advice that gave him the confidence and knowledge to pursue his dream. All of these unique experiences helped to shape the culture and philosophy of Casey’s restaurants. With the support and help of his family, he opened a very warm and inviting small restaurant that served breakfast and lunch along with catering. It quickly drew a lot of attention from the local community and was soon approached by an owner of a restaurant in The Grove. He was impressed by Casey’s little restaurant and convinced him to relocate to a larger space to expand upon what he started with a bigger menu and space. The transition was an exciting one for he began to see all of his work culminate in a restaurant that he had always dreamed of running. Jason Arellano is a chef whose passion for farm to table cuisine extends far beyond his kitchen. To fully immerse himself in the farm to table movement, Jason trained as a farmhand to better understand crops, how to raise healthy livestock, and how the freshest ingredients make their way to a menu. After growing up in the restaurant industry and graduating from the Culinary Institute from America, Jason worked with top chefs throughout NY and NJ, has worked as a Private Chef, and has taught cooking classes for nearly six years. Jason joins us from d’jeet? as our Head Chef. My grandfather founded Vallone's Cannoli Shop in Carteret, NJ (1976-2014), so plenty of my time was spent there among the best cannoli cream imaginable, sfogliatelle, and pink and green italian leaf cookies, to name a few, and I was lucky enough to watch the intricate processes all done by hand. That's where I developed my sweet tooth, but it wasn't until high school that I became interested in baking, coming home after tennis practice and making a mess of my mom's kitchen. I loved seeing the look on student's faces after trying a homemade treat I'd brought in to school after working on for most of the night. In 2010, I was granted a scholarship to French Culinary Institute in Manhattan, NY and landed my first paid job two months before graduation in 2011. In January 2014 I was told by a friend that d'jeet? was looking for a pastry chef, and so I met with Casey, and the rest is history! Working with him and alongside the culinary chefs, it's become standard not to stray too ! far away from tradition when creating a dish, or in my case, a dessert. 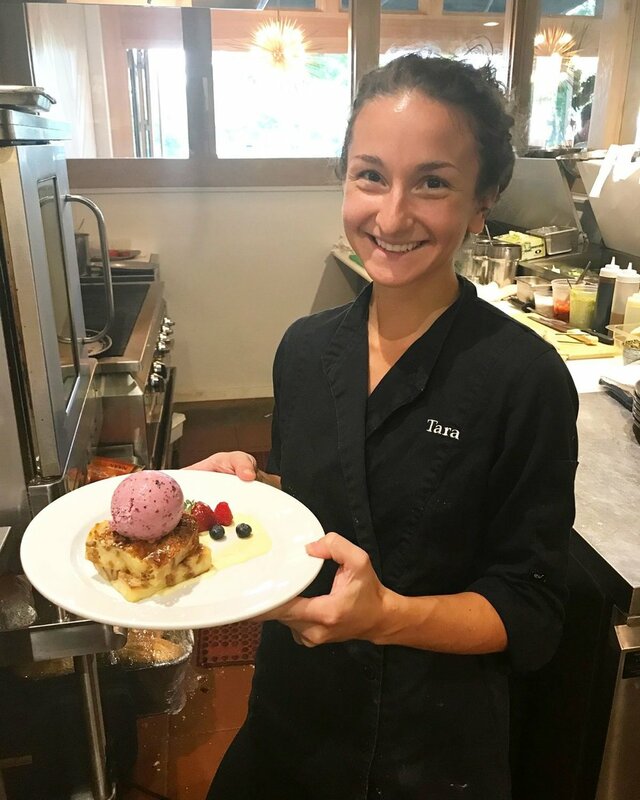 The importance of putting my own spin on a pastry or plated dessert is imperative for success, because that's what customers will start to look for and crave over and over again, especially when a certain taste will make them nostalgic, but they've never seen the dessert as a whole in that way before. After all, everyone wants to feel like they're at home!